A powerful and detailed look into how the class of 1958 has in many ways excelled in the performance of it's RedDevil duties. Very insightful, thought provoking and a testament to the spirit that lives within Douglass. CFN presents this to the entire Douglass family as a guide as to how to have class reunions and show the true Douglass spirit. The Class of 1958 wishes the Class of 1958 God's Speed as they plan their fifty year Jubilee reunion. Our class of 1958 celebrated our first reunion in 1968 and was blessed to participate in the Class of 1968's Baccalaureate ceremonies. We've had class reunions every five years without fail. All of our reunions have included a house lawn party, a group tour, formal banquet, and always ends with many classmates gathering at Gerri Sykes for an all night gabfest. Beginning is 1990 when most of us turned fifty years old; our class celebrated that significant birthday with a three day cruises to the Bahamas. We celebrated turning 60 years old by caravanning from Memphis to our classmates cabin and resort on the Lake of the Ozarks. We celebrated reaching official senior citizen hood at 65 with a house party and banquet. We are already planning how we'll celebrate turning the big "O". For our fifty-year Jubilee reunion, we had a great time at the all school picnic in Douglass Park cooking, socializing, and dancing. It was great sharing the 1958 table at the Maroon & White Banquet. Our reunion ended with the Class of 1958 marching into the ballroom to the music "Pomp & Circumstance" dressed as Sons and Daughters of Douglass with the guys dressed in black pants and White jackets and the women dressed in beautiful white dresses and fancy white pantsuits. About 60 classmates attended. Our program booklet was a book of one-page highlights showing the careers, travels, family, community and spiritual involvement over the fifty years since leaving Douglass. We have been there and done that. Our final celebration was to purchase 100 copies of the "African American Jubilee Edition of the King James Bible to give as gifts to New Douglass eleventh grade parents. We in the Class of 1958 have and continue to be strong supporters of the mission and purposes of the NDAC. We've never given less than $500, started giving at least $1000 in 1998 and have donated more than $2000 each year since 2004. We exceeded our goal of $5000 for 2007 - 2008 as a way for the original 100 members of 1958 to celebrate fifty years since graduation. 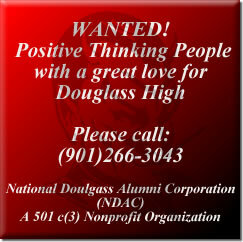 Yes, the Class of 1958 is proud and appreciative of being Douglass Red Devils.